Although improving, accessibility of Twitter and third-party applications has been an issue over the years, and even more so, the images within tweets. You can now provide accessible images for your Tweets using the web-accessible Twitter client Easy Chirp (@EasyChirp) which allows a title (a short description) and a long description to be entered along with the image. The title is required. Web Axe author Dennis Lembree is also the founder of Easy Chirp. Last month, Mark Sadecki of the W3C (@cptvitamin) approached Dennis with an idea for authoring/posting accessible images on twitter. Together they brainstormed a plan. Dennis implemented the plan within a couple weeks but ran into issues during testing. Proper support for the longdesc attribute is still behind in some browsers and assistive technologies. To ensure that everyone has access to the long description, it will also appear directly in the content of the page. Addendum: Here’s an example of the final image page. Easy Chirp also provides a help page which explains the difference between a short and long description and provides information on a couple limitations of the feature. Log in to Easy Chirp with your Twitter account. Select an image from your device. Enter a title of the image (short description). If necessary, enter a long description of the image. Click the Upload Image button. A URL will be inserted in the tweet input (textarea). Finish writing the tweet and click the Post button. Please help the accessibility of the Twittersphere and write a long description or two. Need some ideas? Here are some tweets with interesting images that you can re-post. But be sure to credit the original author! The image hosting service itself is provided via the Imgur API. The soft launch is on the dot org domain; the service will be available on the dot com domain during the official release. Currently on the dot com domain, you can sign up for an announcement when the official launch occurs. For more information, check out this blog about the Easy Chirp 2 beta by Laura Legendary (@Accessible_Info) on her Accessible Insights blog. You can follow Easy Chirp on Twitter at @EasyChirp. Here are some large companies’ accessibility Twitter accounts, and other important related links. Follow for great information. Most of the descriptions are taken from the Twitter bio. @PayPalinclusive – An official feed from the PayPal Accessibility Team and related initiatives. For account-related issues, contact @AskPayPal. San Jose, California. No longer active. @msftEnable by Microsoft. Great info and resources at Microsoft accessibility. @FBaccess – The official Twitter account for the Facebook accessibility team. Please report specific accessibility issues at the Facebook accessibility help center. @w3c_wai – not really a “company” but the owner of WCAG. Nuff said. @YahooAccess – closed, very sad. Hopefully will come back one day. Also, the Yahoo accessibility blog appears to be no longer maintained. And of course, follow me on Twitter at @WebAxe and also on my Web Axe Facebook page. Accessibility Information Pages Show Commitment to all Site Users by @LFLegal (list of companies’ accessibility info pages). HP Accessibility & Aging page. BBC My Web My Way – accessibility how-to for users. Accessibility Statement generator by W3C WAI. Like all 3rd party Twitter apps, Easy Chirp gets its data from the Twitter API. Easy Chirp uses API version 1.0 which is being shut down in one month. It must be re-built with version 1.1. The author of Easy Chirp (who is also the author of Web Axe) created a Kickstarter campaign to acquire minimal funds to rebuild the app with the help of a couple of other developers. At the time of writing, the goal is a little over half-way. 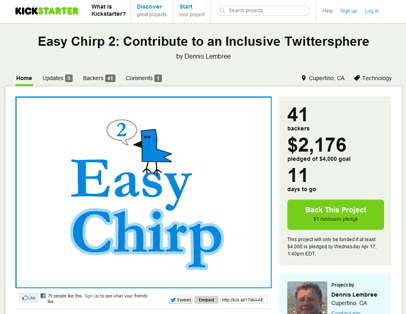 Please consider making a pledge on the Easy Chirp 2 Kickstarter and help maintain “an inclusive Twittersphere”. If you’re unable to pledge, please forward this message to those who may be interested. If the goal of the campaign is not met, there’s a good chance that Easy Chirp will not be updated and Twitter will not be available to those who need it.